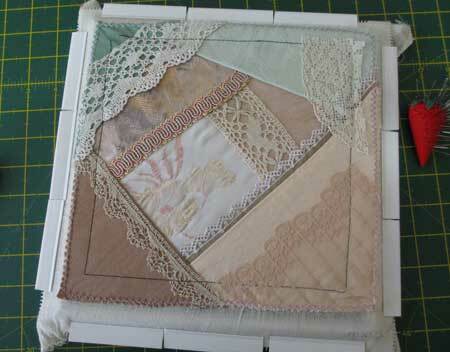 This week for my work in progress I would like share the start of another Crazy Quilt Journal Project block. As I am sure all regular readers know I am running behind in this challenge . This is the block for September! It is lighter as it is the start of spring in Australia. Thanks again for hosting this! It is such a big help! Lovely soft pinks on your new block, like faded roses. I’ve made more progress with my gold work sampler. My latest post is of Josephine stitch – my favourite stitch so far. I looked for a frame like that at a quilt show, but didn’t have any luck. This will be another great block. Here is my latest block for my champagne quilt. You have already put a lot of lovely lace on your bare block, but it will be interesting to see how it grows with each embellishment you put on. What a pretty soft colours in your block. And what a lovely tiny strawberry pincushion. This is a scheduled post for tomorrow morning (it’s still Tuesday evening in my part of the world).